The contest is not starting now. This is an announcement to game designers that a contest will begin in January. There will be at least 500 in prizes during the contest itself. This list is to discuss ideas for the contest. Any germane discussion is appreciated, from rule ideas to complete games. 1) The game must use dice. On each player turn, a player must choose dice or no dice. Other than this optional die roll, there are no random events on the player turn. 2) Random card or chits or whatever may be used to set the scenario. However, all this information is revealed immediately. Once the first player turn begins, there are no secrets, and no random reveals. The only randomness is the dice. 3) It must be reasonably feasible for a player to win without ever choosing the dice. 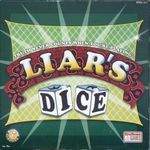 Obviously if a player is behind late in the game, there might be no chance of comeback without gambling, but it needs to happen sometimes that a player never uses the dice. 4) You can use a regular d6, or a specially marked d6, or a d12 or some other odd thing. The die must physically exist. Your game can't use a d37 unless you own a d37. You can roll a single die or multiple dice, but it should be a single roll. The player might have a choice of which dice to roll or which table to roll on. I will be giving 100 on this list. Thumbing the list is appreciated, but do not tip the list. (Someone will tip the list. Just watch.) If you want to contribute to the effort, tip comments on this list. I cannot think of a game which qualifies for this contest. I will begin with examples of how games could be modified to fit these rules. With a little modification, this Sid Sackson classic qualifies. Sometimes you must roll (breaking rule #1). As commonly played it also has secret reveals (breaking rule #2). The solution to the secret reveal is to reveal all the cards in the stacks at the beginning of the game. The solution to the must roll is to have a default draw action. After choosing the equations, choose a color that has a one-for trade, eg red. On your turn you may draw one red rather than roll or trade. Gut feeling says this game is still weak on rule #3. If you have four tokens and they are four parts of a card, you always want to take the 33% shot at big points. The winner of this contest should have more subtlety, to keep the no-dice option useful. Careers is where the idea for the contest began. Careers begins as a roll-and-move game, but then you have the option to use Opportunity and Experience cards. These cards are a limited resource, so you must roll a majority of the time. Careers would actually take a lot of work to fit to the contest. Making the cards deterministic is rather simple; undoing the dice is not. You want to move swiftly around the board to collect your Payday, so the no dice option needs to move you fast. The existing Experience cards move you slowly, and the Opportunity cards require you to go into the profession track. If we give the option of moving 7 instead of the dice, there will be cases where the player would like to move 6, and a 5/36 chance of that could be appealing. If I am on a spot where I desire 3, 5, and 8 over 7, the 11/36 chance may be a very good deal. 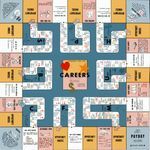 The game which gave me the desire to always have an alternative to dice is ironically too wedded to the dice to easily fix, but in 1955 Careers was awesome. This game is already perfect for this contest except one little detail: There are no dice. The 99 chits are randomized to set the scenario, then it is deterministic the rest of the way. This game now qualifies completely. Similarly Steam could have a gamble for $1 (or 1 VP or $1 on the income track etc). Try to give your game more character than just a simple gamble pasted onto a deterministic game. In a resource gathering game, there would have to be a way to get all the resources. There might be a turn when you can't get wood, and a turn when you can't get stone, but eventually every resource you need would be available without rolling. Also, an action like Build a House is not a valid option when you don't have the wood to do it. There would have to always be a resource gathering option. But I can see a game where the returns are diminishing, and it's a game of chicken. Perhaps the person who rolls will get more, but this replenishes the stacks, so the player who didn't roll can get what he wants. 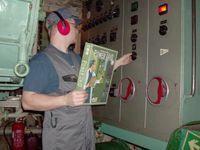 You can choose any one of the three lowest plant to auction, or roll the die. If you roll odd, the fourth plant goes up, if you roll even the fifth goes up. This game runs a little long and has too many dice for what it is, but it's full of fascinating concepts. It has cards that give you dice, pre-rolled to certain numbers. Also there are cards that alter one number to another. I could see a game with these mechanics where rolling is relatively rare. 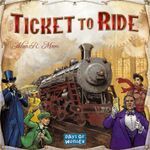 In Ticket to Ride, you pick up a known resource, or you draw from the deck. For this contest, obviously you roll a die instead of drawing a card. If I drew a known card, that cannot trigger a die roll before your turn, so the refill must be deterministic. Some friends of mine and I invented and played a variant of this game where, on your turn, instead of rolling the 2d6 to move, you may play two movement cards - cards numbered 1-6, or you may roll one die and play one card. You start with two of each number, and draw a new card every so often (I don't remember how quickly they are replenished - one each time around the board? It was probably a bit more than that). This way you have a little more control over what space you land on. If any (or most) of the spaces 2-12 away are good for you, you can roll the dice. If there is one place you really need to land, or several spaces you really need to avoid, you can play the exact cards you need to get you there - if you have them! The movement cards replenish fairly slowly, so you have to use them judiciously. I know this doesn't quite fit your criteria, because you sometimes have to roll the dice, to prevent running out of cards too quickly. And there are other random elements in the game. But it's a step toward your concept. This was the game that inspired our Fast Food Franchise variant. 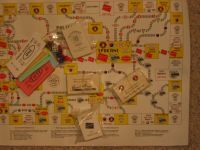 In fact, we used the movement cards from PNWR, for it. 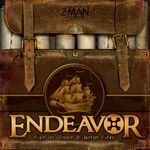 This game already comes closer to your criteria - on your turn, you can either roll the die (d6) to move, or play a card, or pay money ($1 per space, up to 6). You don't get any new cards until someone lands on the Reshuffle Movement Cards space. Theoretically, you could go the whole game without ever rolling to move, and it really wouldn't be much disadvantage at all to doing that - you'd have to make sure to land on the Reshuffle space, but that might easily be made up for by having complete control of all your movement. There are other random things in the game however - (1) the run cards, (2) the Year End/Tax cards, (3) the stock market fluctuations, and (4) the way in which the Movement cards are redistributed. It would be very easy and have minimal impact on the game to make 3 & 4 deterministic. 1 could be made deterministic with some effort and impact on the game. But it would have a major effect on the game to make 2 deterministic, although there may be a way to do it that I haven't thought of. Instead of choosing a role on your turn, you may roll a die to make your selection. If you do, take an additional 2 doubloons from the supply. 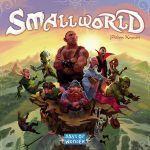 Small World almost fits these constraints perfectly already! So far as I see, to make it fit, you really just need to lay all of the race/trait combos out in a long row at the beginning of the game, so they're known in advance. And play with open money, if it's considered that hidden tokens that everyone has the ability to count and know the value of aren't acceptable. The dice part comes in terms of the conquests - most conquests are entirely deterministic, but the player has the choice with his final conquest of the turn to attempt to conquer a territory he doesn't have enough troops for, and rolls a reinforcement die, which will grant him 3, 2, 1 or no extra troops for that one conquest. So Small World players are not-infrequently faced with the choice between conquering this territory which is guaranteed because they have enough troops, but isn't anything special, or attempting to conquer that territory, which gives them extra victory points because of some race/trait bonus, but needs them to be lucky with the die roll. If the roll is failed, the player's conquest phase ends and those extra troops can only be used to reinforce an existing territory this turn. I was thinking of doing a 2-Player Dice or No Dice Game where the board was a 6x6 matrix. Each player would have 18 tiles of their color and on their turn would place one on any open square. Or they could choose to roll the dice and place a tile on the coordinates the dice produce. Dice coordinates would have two options, unless someone rolled doubles. For instance if you rolled a three and a six, you could play on square (3,6) or (6,3). If both squares are taken, you roll again. There would also be a deck of cards with tetris/blokus shapes on them. Each piece would have a corresponding amount of points to it, that represents how difficult the piece is. Before the game you would randomly deal out ten. If a player is able to form the shape on a card with their tiles on the board, they collect the card and the points for it as soon as they play the completing tile. If a player chooses to roll the dice instead of picking a square by themselves, they get 2 points automatically. So it is easier to complete shapes by picking the spots yourself, but taking a chance can lead to greater amount of points. When the board is filled, the player with the most points wins. This is an economic/role auction/area control game. It has ONE d6 in the game. It is possible for one player to go the whole game without rolling it (either by bidding for the role that says take a building license, or buying them at the end of your turn for resources). I think my weakness with game design contests is I come up with ideas too quickly after I hear a contest. I have an idea, though, that I think could make a pretty cool game idea, and I'd like to share it in case anyone else wants to use it. The idea is that you have a d6 that has 5 sides that show success and one that shows failure. If you want to, you can use that die, but then the next time you use a die, you have to use one that has a 4:2 ratio of success to failure, but gives more reward if you can pull it off. And so on and so forth. Dice that get harder, but more worth it if you succeed. I'm using it in a race game where you can either move at tortoise speed or try to move at hare speed and risk taking a nap. Or crashing or something. There will also be shortcuts you can risk taking but they involve rolling another die and not getting a single failure between both dice. So what did I mean when I said January? Right now, I am asking people to design games and suggest mechanics for other designers. In January there will be a two week submission window. Submissions will be rules in a publicly viewable format. A submission may include a print and play of any level of complexity, or may simply require a . The easier you make it for people to play your game, the more likely people will like it. A game idea might call for a special die when published, but a reference card and common numbered dice should be used in submissions. There are d7s (5-sided ones and 14-sided ones), but you will attract more fans if you stick to d6, d4, d8, d10, d12, and d20. Any ideas on this list are public for all to use. 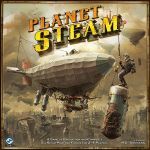 Game submissions will be made public on BGG, but remain the intellectual property of the designers. Well, not all of it, necessarily, but the combat part could be modified to be an interesting dice-optional area control game. In Kemet, combat is between two groups of units, where the attack value of each group is equal to the number of units in it. But, the attack values are modified by one of six cards that each player has. Every time combat is entered into, each player plays one and discards one, only getting the played cards back when they run out. The cards, to varying degrees, increase the attack value, which determines who wins, the damage value, which determines how many of the opposing troops die, and the protection value, the number of your troops you protect from death. So, instead of the selecting and discarding, you would lay out all six in order and when entering into combat, play the next one in sequence or, flip the current card over and roll a d6 to swap it with the one in that position. If you end up having to play a face down card, it either adds no bonus or some weaker overall bonus than any of the cards. There are also divine influence cards that can influence combat, but they can be replaced with a custom die roll. I actually have an idea to adapt this or something like it for this contest. Reading this list might give you some ideas. This game struck my head ... in 10 minutes. #2. This is simple, show all cards, but you can only buy 3 cards that currently "on the top of the deck"
#3 This one is hard. I can't think any. #4. The game is already d6. Is this contest still happening? I just came up with an idea for it, but I haven't done anything yet to flesh it out. I hope it's not too late to start. It's not really based on Keyflower, but I was watching a Keyflower video when the idea hit. Basically, you'd have 36 hex tiles laid out randomly in a 6x6 grid. Each tile would allow you to take some kind of action, and there would be some rules regarding how tiles can be connected to one another. On your turn, you would: 1) take a tile from the grid and place it in your home area; and 2) take one or more actions as your tiles allow (this might be a set number of actions, or maybe there will be action points to spend). The dice rolling will come into play when choosing a tile. If you do not wish to roll the dice, then you can choose any tile in the top row. The tile in the top-left (1,1) space would be free, while you would have to pay for any of the other tiles in that row. If you choose to roll the dice, then you will use the results of 2d6 as coordinates in the grid to take a tile. There would be a cost associated with rolling the dice, and/or there would be a risk of not getting a tile at all. There are a lot of questions still to answer with the design, but those are the basics of it. EDIT: I completely missed the other GeekList somehow. I'll go post this over there.